The Gunfighters originally aired in 1966. Everything excepting that rattlesnake friend of yours Holliday blew in this mornin’. Who’re your friends, Wyatt? Oh, quite, quite so. Allow me, sir, to introduce Miss Dodo Dupont, wizard of the ivory keys, and er Steven Regret, tenor. And lastly sir, your humble servant Doctor Caligari. I am hesitant to turn my trip into the history of Doctor Who into a series of articles about fan opinion or consensus. If I like a story, or dislike a story, I have my reasons that I will often try to explain away. However, sometimes it’s nice to have a bit of context. It is handy, for example, to know that I like The Talons of Weng-Chiang just a little bit less than most fans seem to. The Gunfighters is an oft-maligned serial. It is part of the show’s troubled third season, building – as it did – off the show’s generally quite solid second year. 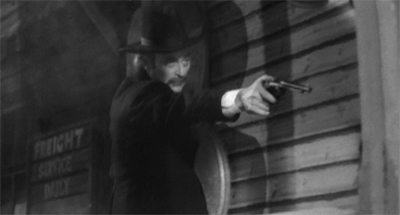 However, I actually enjoy The Gunfighters for what it is, which is a knack I seem to have for a lot of the stories from William Hartnell’s era. Let’s be honest, The Gunfighters is a bit unconvincing. After all, it’s a Western filmed entirely on BBC studio set with an entirely British cast. Sergio Leone might have redefined the genre all the way from Italy, but Doctor Who was very unlikely to do anything like that from a cheap sound stage in England. However, this is only really a problem if you expect The Gunfighters to be convincing. If you go into the serial expecting a Western, you’ll just end up disappointed. If you go into it expecting a very British exploration of the genre, then you might just get what you’re looking for. I am actually quite fond of The Web Planet, another polarising William Hartnell story. I’d argue that the key to appreciating The Web Planet is realising that the production wasn’t aiming to present an ultra-realistic depiction of insectoid alien life on the other side of the universe. It was instead attempting to construct a representation of decidedly alien concepts in a theatrical fashion – it wasn’t meant to fool anybody into thinking they were really on the other side of the universe, but merely to have a bit of fun with the idea. The O.K. Corral might not literally be the other side of the universe, but it seems about as far away. When Steven Moffat commissioned a Western story for the revived series, he was shrewd enough to know that you can’t trust the BBC to provide a convincing Western backdrop. I don’t think it’s unreasonable to suspect that Innes Lloyd was less aware of that fact in 1966. However, he didn’t have the option of location shooting. 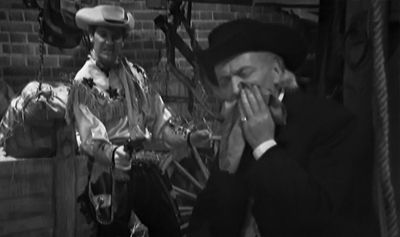 The result is that The Gunfighters is not at all convincing as a depiction of the Wild West, to the point where I’m willing to accept arguments that Doctor Who has featured more convincing depictions of alien worlds up until this point. However, it isn’t about the Wild West. 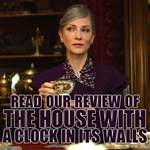 It is about a very British response to the Wild West, if that makes sense. This isn’t about celebrating or revelling in the conventions of the Western as a genre, it’s about dropping a bunch of British characters into an iconic story having a great deal of fun at how delightfully and absurdly unreal it all seems. 1966 is a great year for science-fiction. Doctor Who had firmly established itself in Great Britain, but Star Trek was just launching in the United States. I’d actually be interested in putting together a comparison between these two science-fiction legends at some point in the future, but The Gunfighters provides an interesting contrast between Doctor Who and the new American science-fiction series that wasn’t even on television yet. Gene Roddenberry pitched Star Trek as “wagon train to the stars.” It was very clearly modelled off a very American fantasy – the notion of exploring and expanding into a vast and untamed wilderness. The series played off various romantic Western tropes as the ship would find something new and strange out there in the universe, encounter new life forms and new civilisations, and try to survive in a rugged and harsh landscape. It’s a very romantic depiction of the American Western, and it’s telling that Kirk and his successors were always far more tolerant of new civilisations than many of the explorers that they were emulating. However, Star Trek was, at its core, an optimistic series about spreading values and ideals and discovering that the frontiers of human capability were always being pushed further and further back. 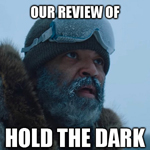 It was a story about fighting back the darkness, establishing a foothold for mankind in the stars through an organised and idealistic political framework. 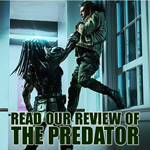 It also involved lots of fist fights and gun battles too, for what it’s worth. This view is in stark contrast to the moral and philosophical outlook of Doctor Who. I suspect that this is due to the fact that Doctor Who was produced as the British Empire collapsed, while Star Trek premièred after America had established itself as one of the dominant powers in global politics. As a rule, Doctor Who was more anarchistic and far more liberal. As a rule, it was more suspicious of vast organisations and infra-structure, more sceptical of authority. This is, of course, a generalisation. John Wiles’ brief tenure as producer on Doctor Who, for example, had a decidedly conservative outlook. However, I think that – broadly speaking – there is a clear distinction between the moral and philosophical perspectives of Star Trek and Doctor Who. And, I would argue, no early serial of Doctor Who expresses this contrast quite as clearly as The Gunfighters, despite airing months before Star Trek hit the airwaves. Quite simply, The Gunfighters tears apart the romanticism of the frontier and demonstrates how clearly the Doctor differs from traditional American leading men. At one point, Harper advises the Doctor, “You see, Doc, the boys don’t want words. They want action.” American action heroes are traditionally men of action. However, the Doctor is a man of words. He looks decidedly uncomfortable carrying a gun (a “wretched weapon”). 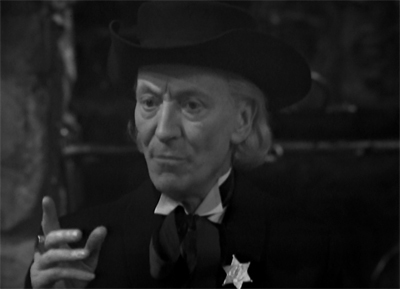 In fact, the Doctor doesn’t even drink, something that never seemed odd before, but is brought up repeatedly in the context of The Gunfighters. Offered a drink, her refuses. 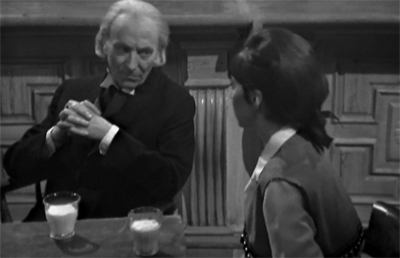 “Well, I’m afraid I don’t touch alcohol, but a little glass of milk and I should be only too delighted.” The Doctor has effectively landed the TARDIS in a Western, but is refusing to play along with the narrative rules. As a result, the whole story gets bent out of shape. Hey wait a minute. You know Holliday? And what’s that to you? You see, a young lady of our acquaintance is with him. And what are you going to do when you find him? I, er, well we’ll take her away from ‘im and bring her back here of course. Plannin’ on gunnin’ him down, eh? Oh certainly not, sir, certainly not. I mean, we’re just going to er, well, er, reason with him. It’s a great moment that underlines the difference in values at work here. 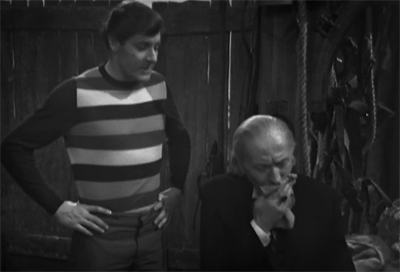 To the Doctor, it seems natural to track down the villain of the week who has kidnapped Dodo and try to talk him down. 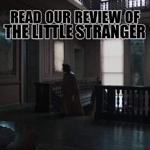 To Johnny Ringo, however, a stranger has arrived complaining that Holliday kidnapped his girl. To Ringo, the only natural conclusion to that particular story is bloodshed. Indeed, the serial makes a point to contrast the Doctor with Doc Holliday, generally considered one of the “good guys” at the O.K. Corral. Indeed, a great deal of the plot runs on the confusion between the Doctor and the Doc, which stems from an amusing enough bit of confused dialogue on the Doctor’s part. 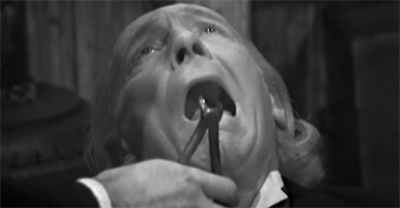 It’s quite clear that William Hartnell and the producers where quite capable of playing up his occasional speech difficulties and incorporating them into the plot. However, there’s also a sense that the show is contrasting the Doctor with a reflection of the man that he used to be. Doc Holliday is cowardly and manipulative, willing to effectively sentence a stranger to death if it will get him off the hook. Indeed, Holliday even “steals” Dodo away on his adventure, in much the same way that the Doctor originally kidnapped Ian and Barbara. This seems to be an attempt to demonstrate just how far the Doctor has come in the time since we first met him. Absolutely everything about The Gunfighters seems decidedly unreal. The line-up of cowboys participating in the climactic gun battle is entirely incorrect, but I would argue that this supports the argument that The Gunfighters is unconcerned with “real” history or the “real” Wild West. 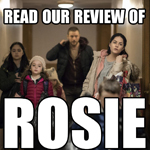 Instead, it’s an attempt to channel what is effectively an American mythology, and to have a great deal of fun at its expense. Compare The Gunfighters with the show’s most recent Western, A Town Called Mercy. A Town Called Mercy is a much more affectionate attempt to celebrate the Western as a genre. Indeed, it ends acknowledging the Gunslinger as a mythic figure quite similar to the Doctor himself. 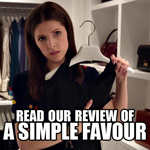 It’s a much more friendly and earnest appreciation of the genre. 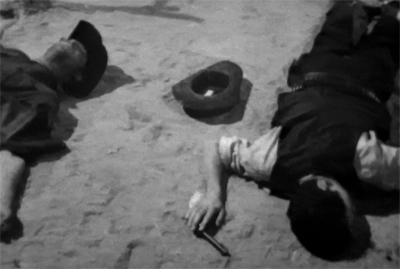 In contrast, The Gunfighters is downright cynical and subversive. 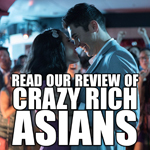 In fact, Steven’s attempts to fit in and play along with the Western tropes are openly mocked. I actually think that Peter Purves has an excellent sense of comic timing – especially little touches like reacting to accidentally setting off his firearm. I love that Steven is the one most excited by the cowboys and so keen to play into the macho stereotypes, and yet so completely incapable of blending in. That seems to be the point of The Gunfighters. 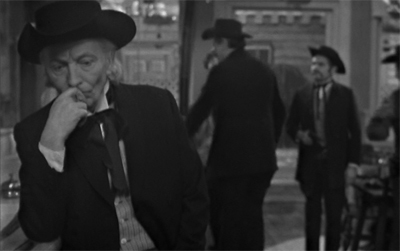 If Doctor Who in 1966 made a serious attempt to do a Western, it would be positively embarrassing. It seems we’ve come quite a long way since the caution about meddling that the Doctor demonstrated in The Aztecs. That said, perhaps the Doctor is justifying his interference to save Steven’s life. “Oh, how can I possibly sleep my dear, knowing that Steven is mixed up with all this?” he ponders, even if he also seems genuinely concerned about the fate of “Mister Werp.” Still, The Gunfighters serves as yet another demonstration of just how far the Doctor has come since he first appeared all those years ago. 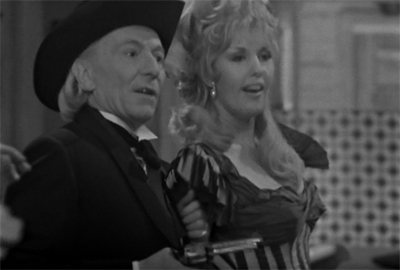 The Gunfighters is a much-maligned piece of Doctor Who history. I suspect it will be for a long time. 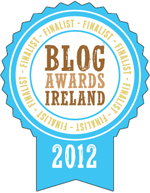 However, despite that, I’m actually reasonably fond of it. Okay, The Ballad of the Last Chance Saloon is a little annoying, some of the accents are quite frustrating, and the comedy stammer from one of the supporting players can get quite irritating. It’s not a flawless production by any means, and certainly not an ideal place to start with the classic series. However, if you have a sense of humour about the show, and are willing to embrace the surreal and the bizarre, it’s quite an entertaining little adventure. Well, I had to find some sort of suitable cover. After all, you can’t walk into the middle of a Western town and say that you’ve come from outer space. Good gracious me, we’d all be arrested on a vagrancy charge.